Autel MaxiSYS MS906 is next generation of autel maxidas ds708. Maxisys MS906 run faster speed than DS708. 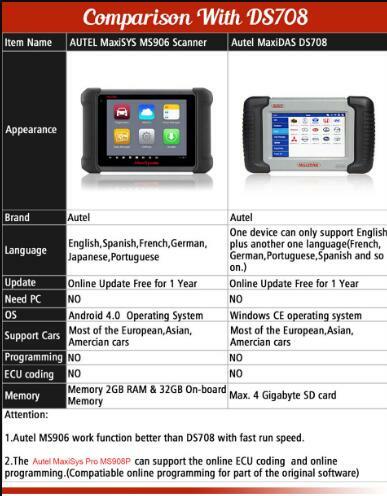 Autel Maxisys DS906 has bigger touch screen than Maxidas DS708. 3. Support English. 1 year warranty and 1 year free online update . 4. Complete capabilities for codes, live data, active test, ECU information, adaptation, matching, etc. 5. With a Big Screen.